Sitting in a classroom at the Wine House in Los Angeles last Saturday, Diego Meraviglia began a lecture with the words, “Italy is an amusement park for wine geeks”. That’s when I knew these were my people. Valle d’Aosta. Yes, you can grow wine grapes here. No, there is no Zinfandel. The course has been very interesting so far- I love learning about all the strange and esoteric varietals, and value the opportunity to revel in my wine geekery with other similarly wine geeky folk. Who knew there were so many people excited about Pigato and Ormeasco from Liguria? Of all the wines we tasted last week, my favorite was a beautiful Nebbiolo from Travaglini Tre Vigne 2005. 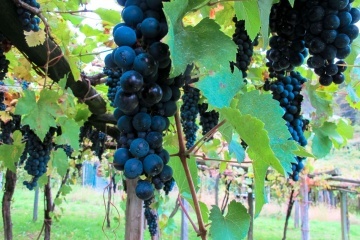 The wine is produced in Gattinara (Northern Piemonte), where Diego explained Nebbiolo is also known as “Spanna” due to the common practice of planting the vines at a hand’s span apart. The Travaglini Gattinara was gorgeous garnet-red in the glass with a pretty rim of brick-red- common in Nebbiolo. Fascinating hints of orange rind and tea leaf on the nose layered under the typical Nebbiolo trademarks of violets and maraschino cherries. Deliciously crisp and smooth- this wine was ready to drink, but could easily improve over the next 15 years. There is nothing but potential in this kind of young wine, with so many evolving layers of texture and aroma. I’m already looking forward to Saturday’s new lesson. I’m sure we’ll discover a few new Italian wines to geek out over. Official Italian Sommelier tasting kit, next to official Italian wine tasting dog (not included).